h Too Big To Fail. It's supposed to say 'omnis'. Not 'omis'. 'Omnis'. Justin's been tempted to work on a little project lately. He developed an experiment of recording an electric guitar with both a direct microphone (very close to the amplifier) and three different ways of blending in the room sound. If you don't know much about this but are at least curious enough to be reading this, the point is to give some impression of the room that the sound was recorded in. By blending this sound with the more dry sound of the microphone right up against the amp, you can tailor the recorded sound to present a more or less physical/diffuse recording. But what's the best way of getting that more ambient sound? 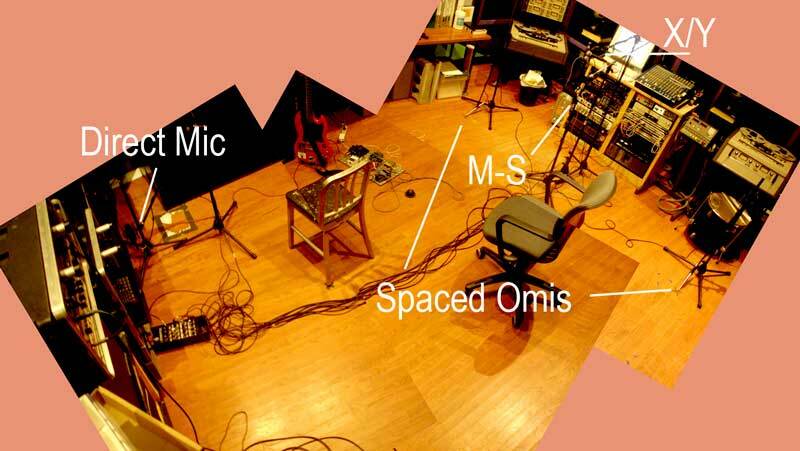 We've typically used two omnidirectional microphones (microphones that pick up sound whether it comes from in front or in back of them) taped to the floor of the studio in a specific place. But, more out of odd compulsion than specific necessity, Justin figured he'd try to compare three different approaches to capturing the room sound - the tried and true 'spaced omni' approach, a cardioid XY approach and the intriguing Mid-Side approach. These are all outlined [ here ]. Spaced Pair - Earthworks TC 30 Ks run through a Hamptone JFET Preamp. Spaced approx 7 ft apart, 12 feet from the sound source. Placed nearly on floor to minimize boundary effect. X/Y - beyerdynamic M 160s run through an FMR RNP. Also spaced 12 feet from the sound source, centered in the room. About 4 feet off the ground because that's where the stand fit. Mid-Side - Josephson e22s for the Mid, beyerdynamic M 130 for the Side, both run through a Sytek MPX-4aii. Sitting directly below the X/Y pair, about 3.5 feet off the ground for the same reason. Care was taken to make sure that the relative level of direct to ambient was the same for each of the approaches. Justin also did his best to make phase coherent comparisons, but he really didn't spend much time tweaking the mic placement. This may have a subtle effect. As noted in the audio file, the idea here is to pay attention to the different impression of the stereo presentation, not the specific sounds of the equipment to get it. Oh, and speaking of the audio file, the guitar track gets more useful (for comparison purposes) as it goes on. [ Experiment results ] 6 min, 25 sec - 14.7MB, 320kbps MP3. It's quiet - sorry. General impressions? I'm surprised at how much livelier the stereo image is for both the X/Y and M-S techniques vs. the spaced pair. It's tougher to pin down the differences between those two approaches, though, as the equipment differences (different mics/preamps) are much more of a distraction for the subtle distinctions between the techniques. It seems, though, that one of those two approaches are good when the recorder wants to create a wide and dynamic stereo impression, such as one would use for drums. For more complex single signals (such as a distorted, amplified instrument), the spaced pair may offer a nice contrast in the stereo field.